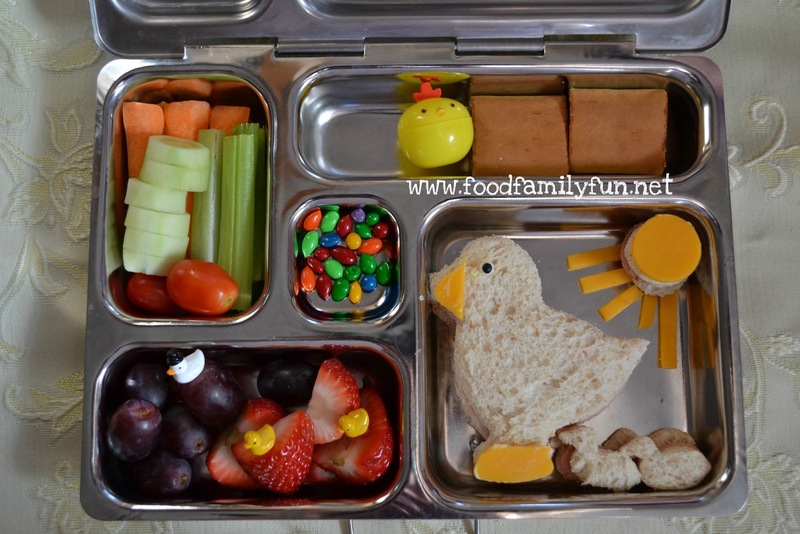 I packed two very similar lunches for Rose & Heidi last week. Heidi has Trix yogurt with rainbow sprinkles, strawberries & green grapes, carrots & yellow peppers, raspberries & blueberries, raisins & 2 monkey sandwiches (ham). Rose's lunch is almost identical. 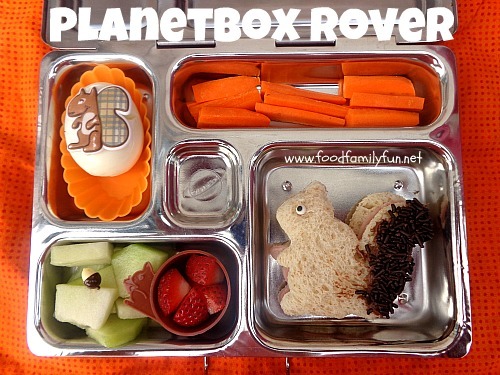 She has pumpkin seeds instead of raisins and Rose's monkey sandwiches are chocolate & peanut butter spread. We have been loving our new Yumboxes. There is only one slight drawback. We don't have a dishwasher and the inner plastic is a bit of a pain to dry! The underside of the clear insert has a channel all around and that is very tricky to dry. 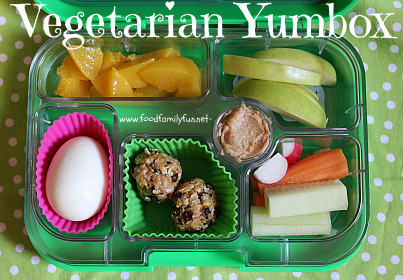 I packed a very simple vegetarian lunch for Rose in her new Yumbox last week. 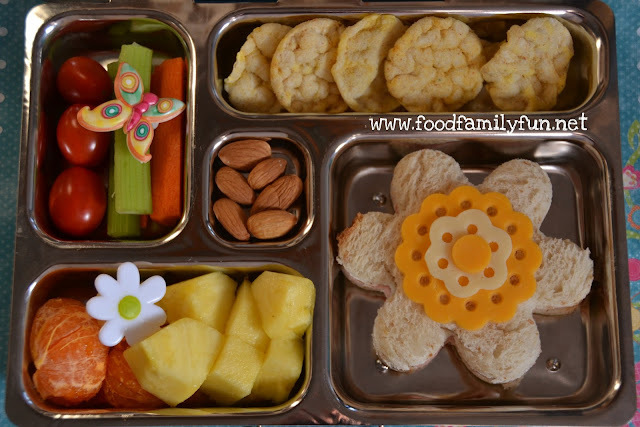 Rose has cherry yogurt & plain greek yogurt swirled together and topped with sprinkles, diced peaches, cheddar and colby jack cheese cubes, mini crackers, a couple of fruit snacks and her favourite veggies - cucumber and yellow peppers. When it came home empty I asked her about eating everything worried that she was still hungry. Nope! Her teacher had birthday cupcakes but they had to eat all of her lunch first. So the size is actually quite perfect. I bought the girls some new lunchboxes. 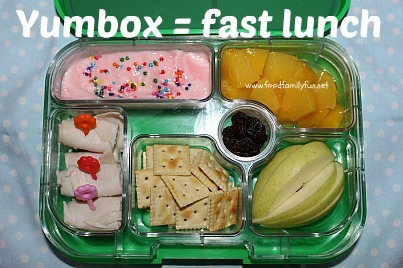 Yumbox lunchboxes. They are smaller than our regularly used planetboxes, each compartment seals completely when closed so you can pack yogurt, applesauce, dip in any of the comparments and it won't leak into another one. So far they have a thumbs up! 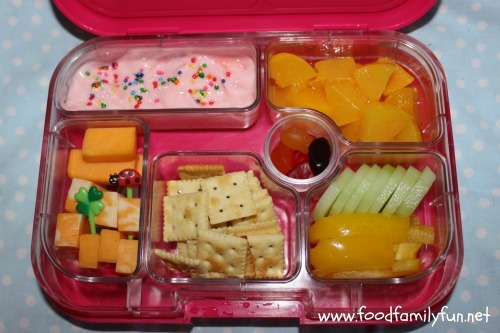 Heidi's lunch has cherry yogurt with sprinkles, diced peaches, rolled up low sodium turkey, mini crackers, apple slices, raisins. 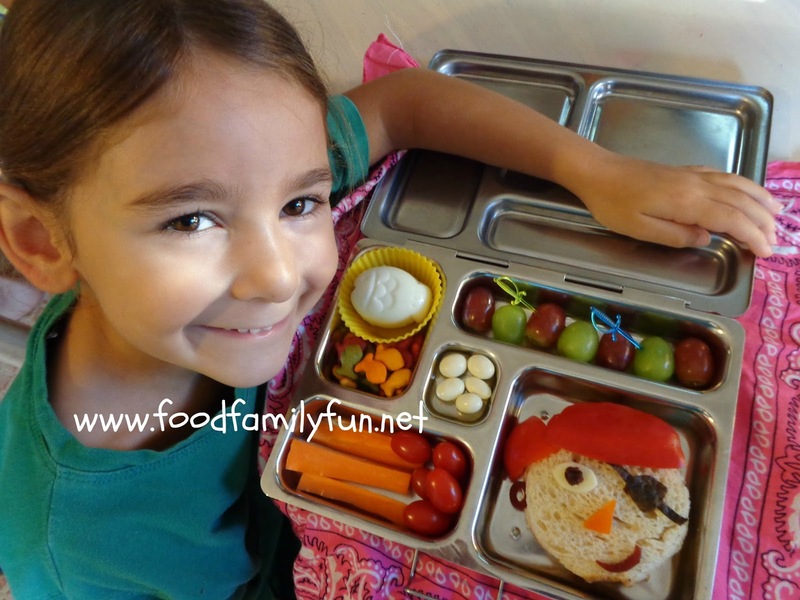 She loved her new lunchbox. Happy New Year everyone! Wow. 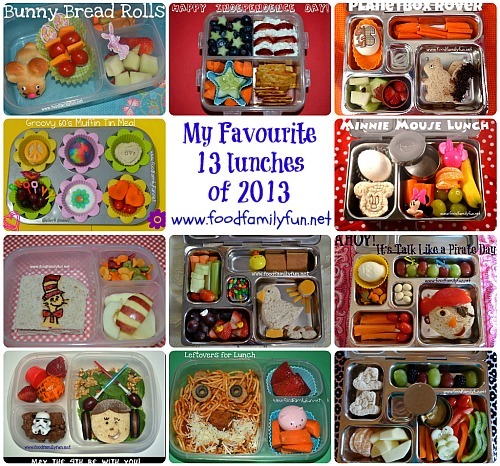 Who knew it would be so hard to choose my favourite 13 lunches! I think I love them all so the girls helped me narrow down my final decision to a lucky 13 for 2013. I love the ease of this lunch. The sandwich looks like a fancy flower but it was so simple to make using a cutter set. 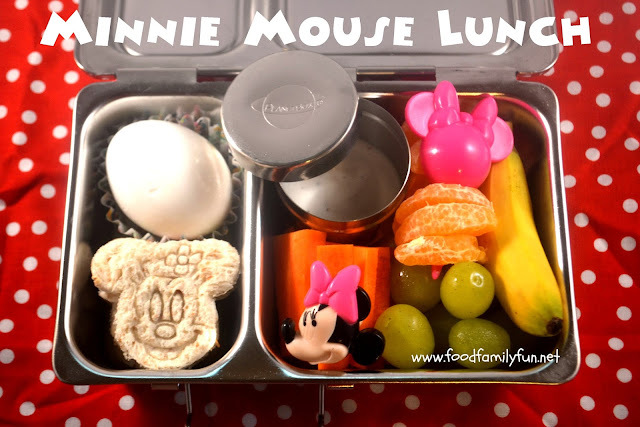 While I was writing this post and choosing my favourite lunches Rose said - "Oh I remember that lunch - it was yummy!" It definitely had to make the cut. What's not to love? Happy Birthday to one of my sweet girls, sandwiches on a stick, a rainbow of fruit. This was an easy pick for my favourite 13 lunches. 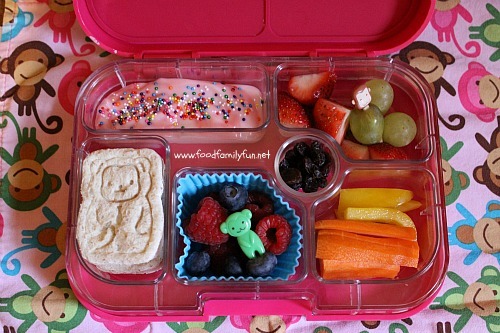 I love this lunch, nothing is overly fancy, just some yummy fruits, veggies and hummus, and some pretty little hat sammies. 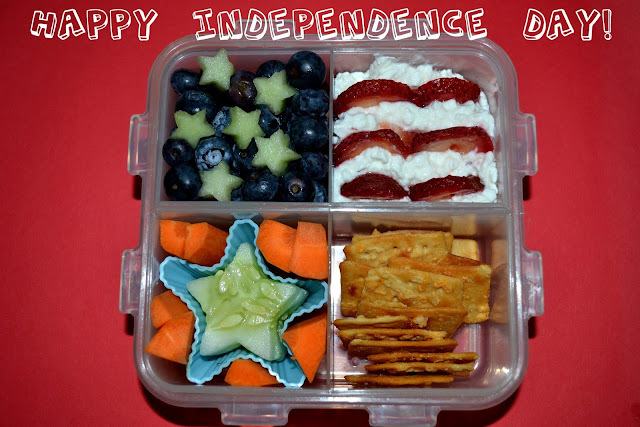 This was so fast and simple to put together after dinner, right when I was packing up the leftovers. My first time ever attempting cheese art. I didn't get around to posting another one again. It just takes me a little longer than I usually have for lunches, but I still want to try again. 8. May the 4th be with you! 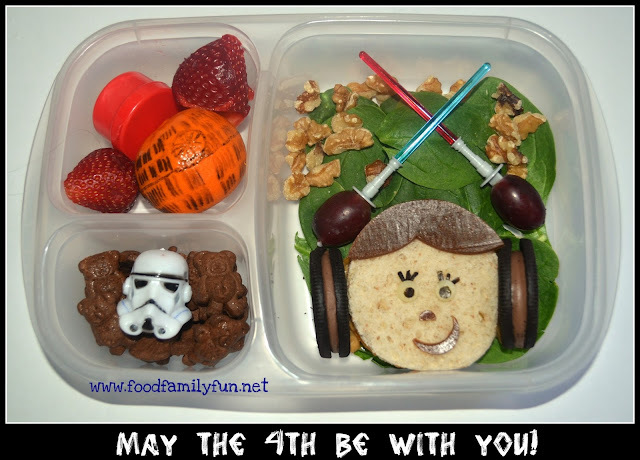 This was a lunch for me that I made for a blog hop. It's easy for me to choose my blog hop lunches since I tend to spend a little extra time making them to fit the theme - I end up loving them all! I love the bushy tail! 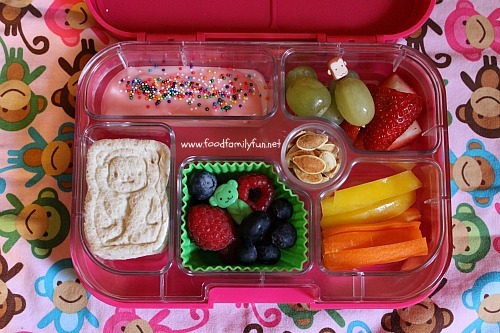 The photo wasn't so great (back when my camera was on the fritz) but I just love this little lunch and the mini banana. I like the baby ducks and the shining sun. Makes me smile and think happy thoughts. Sort of a late breakfast early lunch meal for me. 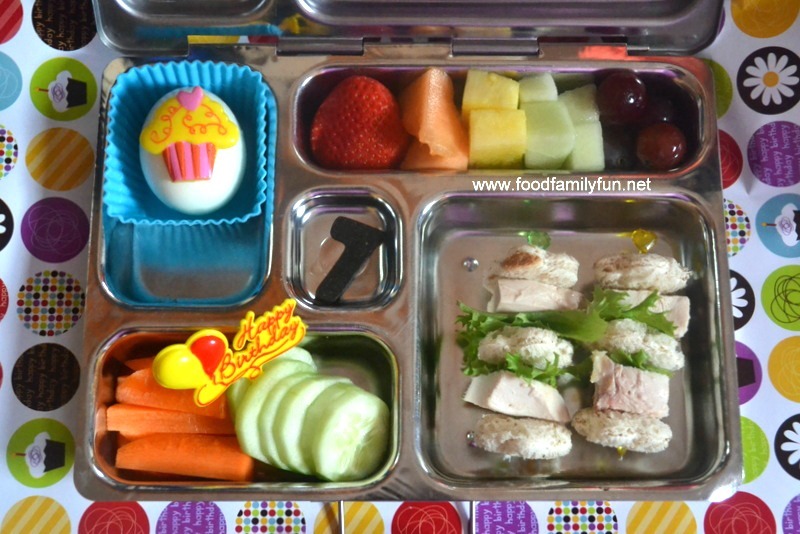 This is one of my favourites because it was just a fun, low effort bento that looked and tasted pretty good! 3. Arrr! It's talk like a pirate day! 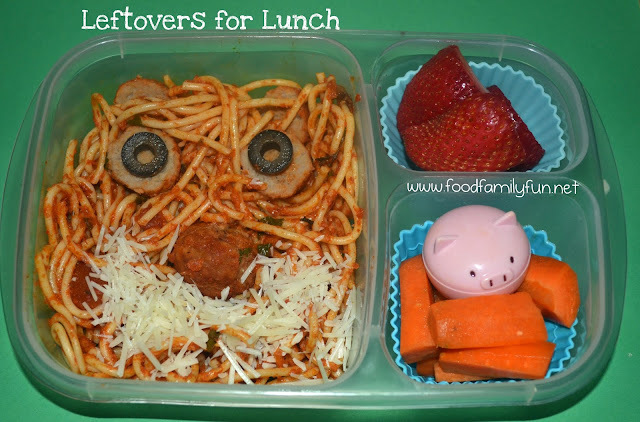 What I love the most about this lunch was the reaction from my daughter (which is why I make fun lunches in the first place). She was thrilled. So it's easily in my top 3. I don't get the chance to make many Muffin Tin Meals any more and this was just plain fun to make. It hits the trifecta - fun to make, fun to eat and healthy too! 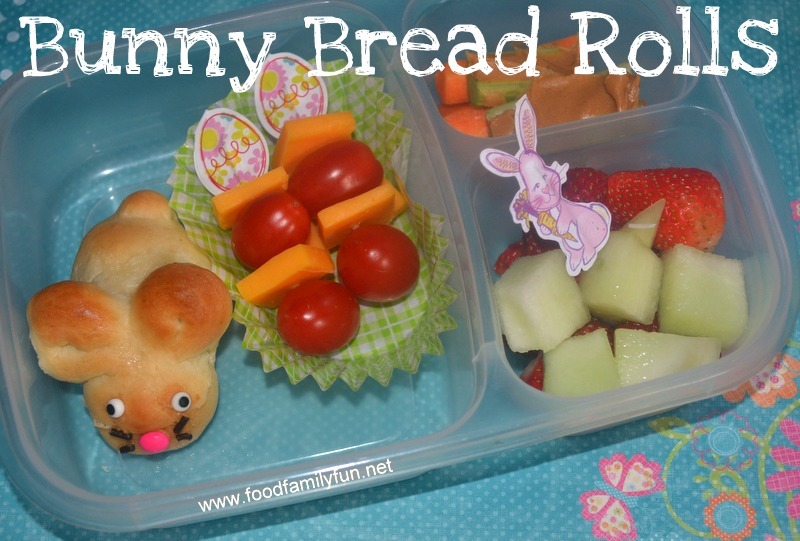 I LOVED making the cute little bunny rolls and all of the girls were over the moon when they saw them. Even if my eldest thought they looked more like mice. Ha! Easily my favourite lunch of 2013! 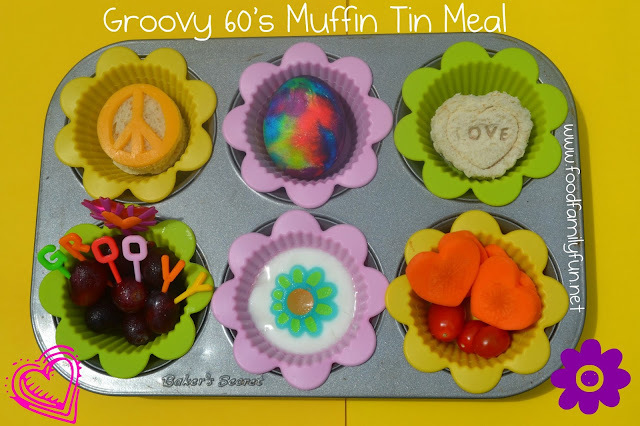 This post is part of a fun linky party with my Bento Bloggers and Friends. I am glad to have started this blogging journey and to have made so many new friends. They really are a talented bunch that inspire me daily. Click the button to get to the linky party and discover my BBF's Favourite Lunches of 2013. I promise that you will be amazed!